WHEELS: 17" X 8.0" ALUMINUM (STD), TRANSMISSION: 8-SPEED AUTOMATIC (845RE) (STD), TRAILER TOW GROUP IV -inc: Rear Load Leveling Suspension, 7 & 4 Pin Wiring Harness, Delete Rear Tow Hook, Class IV Receiver Hitch, 180 Amp Alternator, Heavy Duty Engine Cooling, Full Size Spare Tire, Steel Spare Wheel, TIRES: P245/70R17 BSW ON/OFF ROAD (STD), QUICK ORDER PACKAGE 23E -inc: Engine: 3.6L V6 24V VVT, Transmission: 8-Speed Automatic (845RE), Power 4-Way Driver Lumbar Adjust, Bright Side Roof Rails, Power 8-Way Driver/Manual Passenger Seat, SIRIUSXM Satellite Radio (subscription required) For more information, call 800-643-2112, Not available w/AK, HI, Puerto Rico, St, Thomas/Virgin Islands, Barbados, Dominican Republic and Guam, MANUFACTURER'S STATEMENT OF ORIGIN, ENGINE: 3.6L V6 24V VVT (STD), BRILLIANT BLACK CRYSTAL PEARLCOAT, BLACK, CLOTH LOW BACK BUCKET SEATS, Wheels: 17" x 8.0" Aluminum. 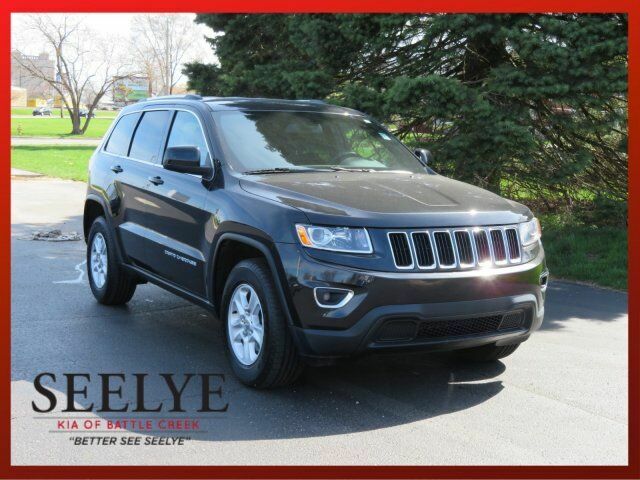 This Jeep Grand Cherokee has a dependable Regular Unleaded V-6 3.6 L/220 engine powering this Automatic transmission. Trip Computer, Transmission: 8-Speed Automatic (845RE), Transmission w/Driver Selectable Mode and Sequential Shift Control w/Steering Wheel Controls, Tracker System, Towing Equipment -inc: Trailer Sway Control, Tires: P245/70R17 BSW On/Off Road, Tire Specific Low Tire Pressure Warning, Tailgate/Rear Door Lock Included w/Power Door Locks, Systems Monitor, Steel Spare Wheel, Speed Sensitive Variable Intermittent Wipers, Single Stainless Steel Exhaust, Side Impact Beams, Short And Long Arm Front Suspension, Sentry Key Engine Immobilizer, Rocker Panel Extensions and Black Wheel Well Trim, Remote Releases -Inc: Power Fuel, Remote Keyless Entry w/Integrated Key Transmitter, Illuminated Entry and Panic Button, Rear Cupholder, Rear Child Safety Locks.